A letterpress postcard book composed of twelve blank postcards and a front and back cover joined by a sliding plastic spine, The Logical Way to Become an Artist may be appreciated as an artistic/scientific treatise or an adult coloring book. Or both. The book is open to interpretation. The twelve subject headings, which were all common themes depicted by artists in Renaissance or Baroque periods, indicate several things: 1) that choices were limited for centuries to Biblical and then later mythological scenes as well as portraits of noble families or clergy; 2) that many of the scenes were gory or violent and might be considered unacceptable by today’s atmosphere of censorship, such as “circumcision” or St. Catherine with her torture implements. Saints and Biblical figures were depicted with one breast cut off, skinned, tortured, or carrying bloody heads. Female figures were shown copulating with beasts or satyrs. There were many licentious and disturbing themes, often with women. 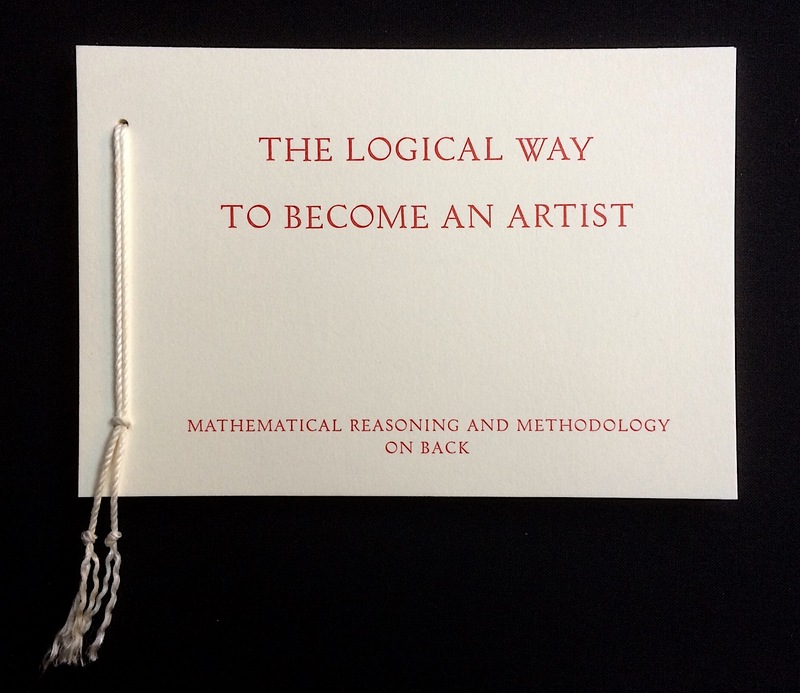 The title and text on back poke humor at how-to books, attempts to make scientific theories from philosophy, and the people that insist their six-year-old child is capable of creating the art they see in museums. Maybe the child is capable. In fact, this simple formula allows everyone to become an artist, doesn’t it? Printed at Stamperia Valdonega on acid-free paper made by Cartiere Fedrigoni. What do Artemisia Gentileschi, Mantegna, Botticelli, Lorenzo Lotto, Guido Reni, Rembrandt, Lavinia Fontana, Veronese, Tintoretto, Tiziano, Guercino, Van Dyck and Tiepolo have in common? They were all European? They wore uncomfortable shoes? They didn’t know artist’s materials were toxic? Maybe so. But actually, they all had something else in common. All these people painted nine out of the twelve subjects printed on the back of these cards, and they are considered outstanding artists. So it logically follows that if you paint these subjects, you too will become an outstanding artist. Not necessarily while you are alive. It might take a while, but this will eventually happen. Just fill in these pre-labeled cards with the appropriate category. 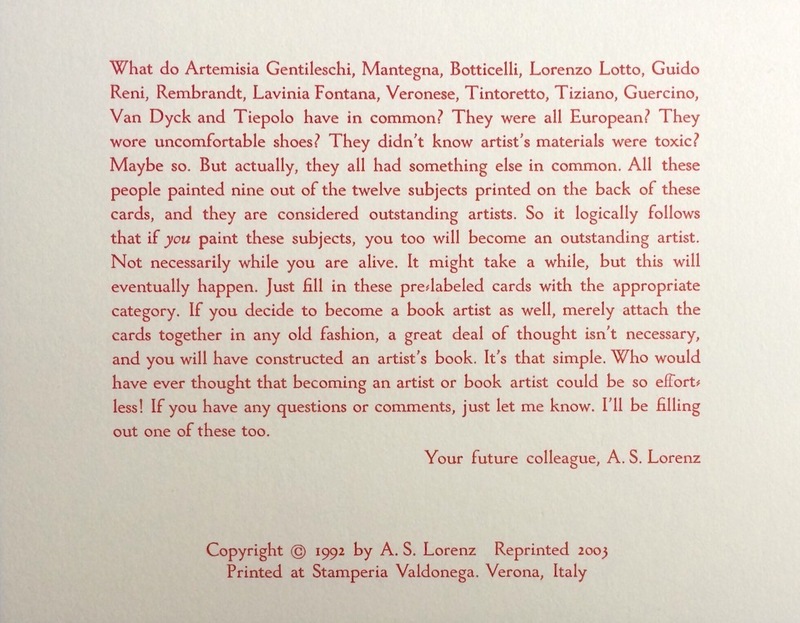 If you decide to become a book artist as well, merely attach the cards together in any old fashion, a great deal of thought isn’t necessary, and you will have constructed an artist’s book. It’s that simple. Who would have ever thought that becoming an artist or book artist could be so effortless! If you have any questions or comments, just let me know. I’ll be filling out one of these too.